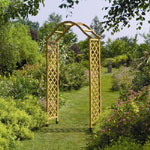 This garden border garden fence Traditional hoop top fence. This steel garden border fence is Green PVC coated. This garden fencing is Attractive and functional. 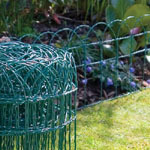 These coated garden wires are easy to erect with no need for straining wires. This metal garden PVC wire has self supporting spiked legs. These garden border fencing will create either low border fence or decorative mid height fence. Size: 10m (33') Long x 25cm (8"). Size: 10m (33') Long x 40cm (1' 3"). Size: 10m (33') Long x 65cm (2' 1"). Size: 10m (33') Long x 90cm (3'). 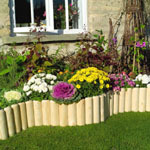 We also sell log rolls ideal edging for lawns and garden borders. We have 7 different heights of logroll and timber edging. See our range of natural bamboo screening and bamboo fencing is ideal for garden, balcony and terrace use. These bamboo screenings can be used vertically to make or attach to a fence or can be used horizontally to create natural looking shaded areas in your garden.